This page contains affiliate links, which means I’ll earn a small commission if you purchase something (at no additional cost to you!) Thanks for supporting Life As A Strawberry! Meal planning is great (save time! save money! eat healthy!) but if you haven’t done it before, it’s not always easy to figure out where you should start. 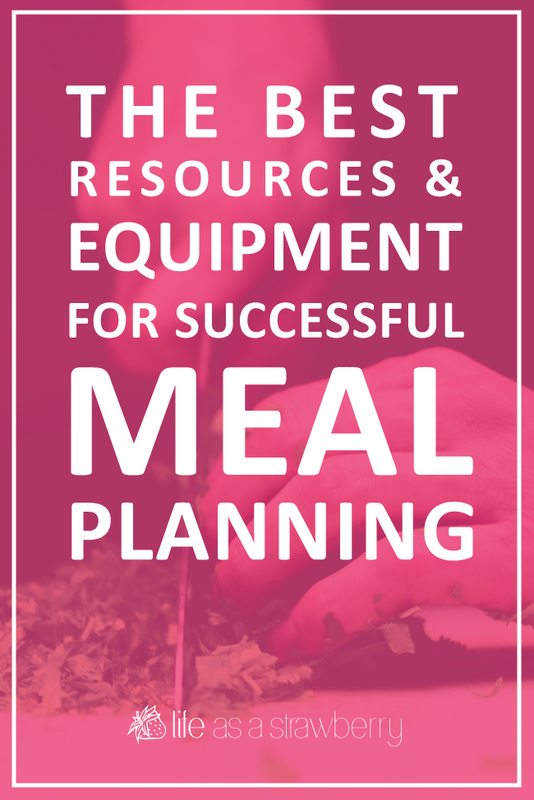 To help, I’ve put together my favorite planning resources and prep equipment to help you master your meal planning and get healthy, delicious dinners on the table – even on your busiest weeknights! 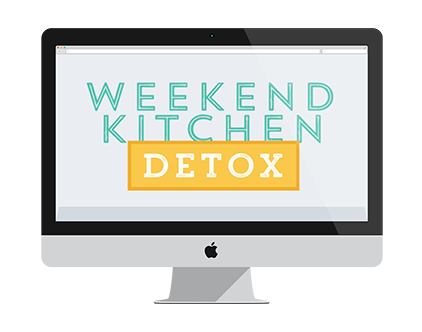 The Weekend Kitchen Detox // My go-at-your-own pace online course walks you through a kitchen detox STEP BY STEP – in just one weekend! Use the course worksheets to take an easy inventory of your pantry, fridge, freezer, and kitchen equipment, and then use the included checklists to stock up on all the essentials. Video trainings, checklists, and cheatsheets take all the work out of organizing your kitchen – so you’ll have a freshly organized, stocked kitchen with plenty of time to spare for a glass of wine and a good ol’ Netflix binge. Click here to join The Weekend Kitchen Detox! 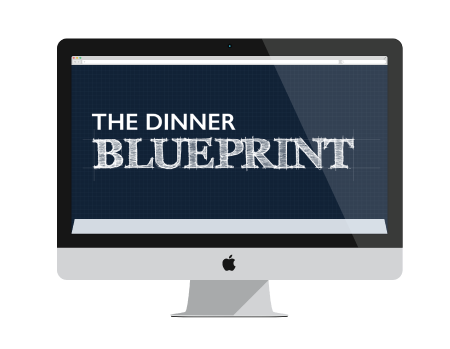 The Dinner Blueprint // My flagship, go-at-your-own pace online course. The Dinner Blueprint teaches you my BEST meal planning, prep, and storage strategies so that you can put healthy, delicious food on the table even on your busiest evenings. Hands-on video trainings, checklists, and worksheets will walk you through building your personal, perfect meal plan one step at a time. Learn how to assess your current spending, set and stick to a budget, prep and store food, plan nutritious meals in just 15 minutes a week, and streamline your grocery shopping. You’ll save money, eat better, and eliminate the stress of frantic weeknight dinners. Enrollment for The Dinner Blueprint is open through August 15th! Click here to join before the course closes until 2018! Meal Planning Worksheets// When you join my email list, you get FREE access to my Resource Library, which is full of worksheets, cheatsheets, and recipe e-books to help you out in the kitchen. 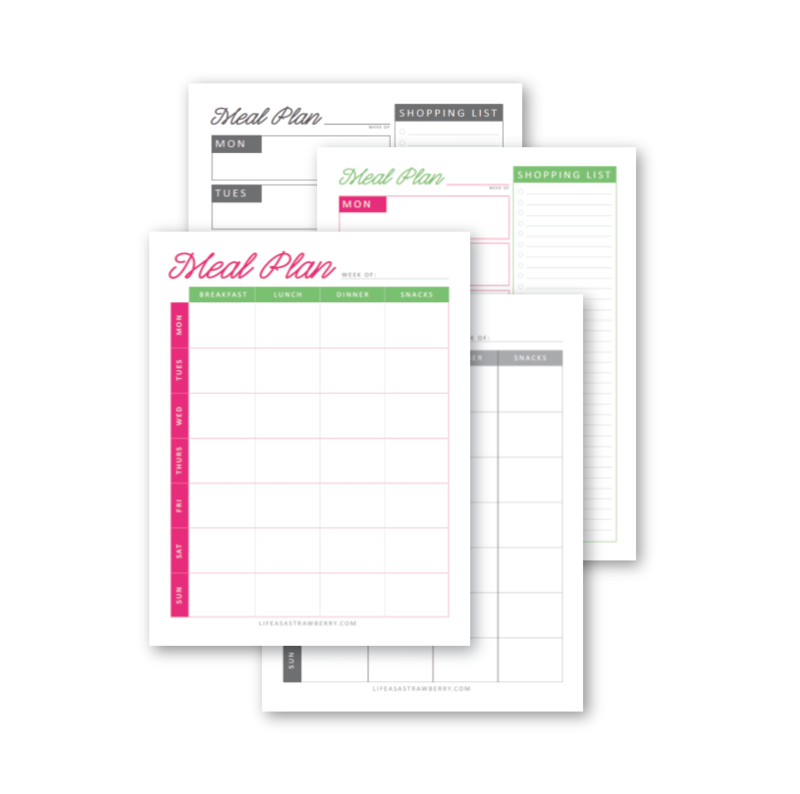 These printable, fillable Meal Planning Worksheets will help you plan a week’s worth of meals and snacks for a stress-free week of cooking. 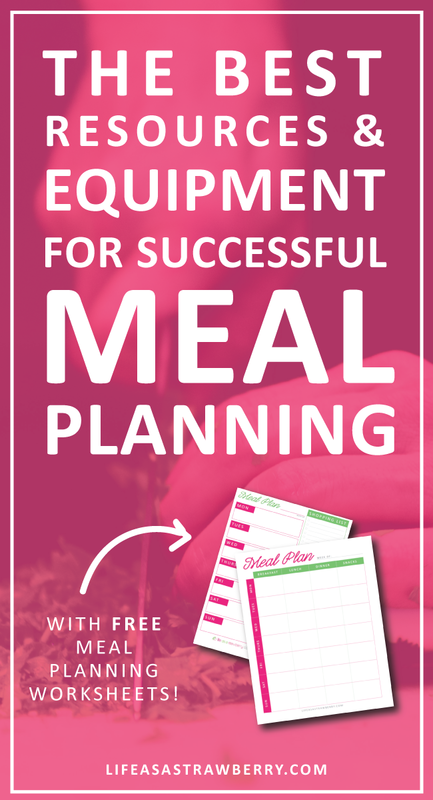 Click here to get the free meal planning worksheets! Pyrex Glass Food Storage Set // Good food storage containers are a MUST for effective meal prep, and these glass containers from Pyrex are my favorite. The BPA-free lid means you don’t have to worry about harmful chemicals leeching into your food, and the sturdy glass containers can easily go from freezer to fridge to oven to dishwasher – which means less cleanup for you. Large Cutting Board // A good, LARGE cutting board is an important tool for easy meal prep and planning. Small or oddly-shaped cutting boards can make it hard to efficiently and safely prepare food, so I recommend getting a large, flat, rectangular board that lets you chop with plenty of room. This one from Faberware is 12×18 inches, BPA-free, dishwasher safe, and available for under $20. I have the knife pictured here – a Shun 8-inch chef’s knife – and I LOVE it, but there are plenty of options available to fit any budget. I recommend visiting a local specialty store like Sur La Table so that you can test the knives yourself and see what feels best in your hand. If you purchase a knife from a quality store or company, they often also come with free or cheap sharpening services, so you can easily keep your knife professionally sharpened. Zyliss Lock N’ Lift Can Opener // I need you to trust me when I tell you that you NEED this can opener. I buy it for EVERYONE. Birthday? You’re getting this can opener. Wedding? Can opener. Retirement party? Baby shower? Asked me to help during your dinner party and handed me a sharp little metal thing to open the canned corn? Yup. CAN OPENER. There is nothing more frustrating than trying to throw a quick dinner together and practically ripping your hand apart trying to open a can of corn with an old or sharp or terrible can opener. This one is only fifteen bucks and it will CHANGE. YOUR. LIFE. Metal Kitchen Tongs // My kitchen tongs are the most-used tool in my kitchen. They make a world of difference with things like mixing spaghetti, pulling hot baked potatoes from an oven, or cooking long veggies like green beans and asparagus. Use them like an extension of your hand for easy cooking (or, y’know, for grabbing things off the top shelf). These tongs from OXO are simple but sturdy. They also lock in place for easy storage and are dishwasher safe.